At the outset, I would like to offer my felicitations to all members of the nursing community in our country on "International Nurses Day”. The National Florence Nightingale Awards are a befitting recognition of the extraordinary services rendered by nurses who have served the sick and the ailing, with compassion, patience and courage. May 12 marks the birth anniversary of Florence Nightingale who more than a century ago, established the first Institution to train nurses. Today nursing has evolved into a modern medical profession with wealth of skills and professional knowledge. Nurses form a large and critical part of the health workforce who are the backbone of the healthcare system. As keen facilitators of the healthcare, they are the pivot in the Hospital-Doctor-Patient paradigm. Whether it is preventive care, home care or hospital care, nurses are an indispensable part of the healthcare. 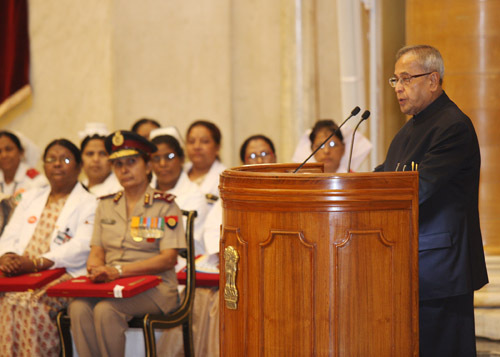 Today, in India, we have our own versions of Florence Nightingale – in all our States- in urban and in remote regions - who have earned the well-deserved reputation of being highly disciplined and professional. They have developed nursing into a noble specialisation and have themselves become synonymous with competence and unparalleled commitment. It is no wonder that they are appreciated - and their services sought - all over the world. Government of India, in its 12th Five Year Plan, has set the goal of health for all. With the expansion of our medical infrastructure and its coverage, there will be an increased demand for nursing staff. This can be addressed by augmenting capacities in existing institutions and by opening many more nursing schools. I understand that this year the International Council of Nurses has chosen the theme, "Closing the Gap”. In doing so, they have brought focus to the Millennium Development Goals related to improving maternal health, reducing child mortality and combating HIV/AIDS, malaria and other diseases. Our Government has a number of well-established schemes in these areas. The time has come to effectively utilise the services of Nurses in Public Health Services beyond their traditional domain of hospitals and dispensaries. The skills of our Nurses can be used to great advantage in improving health services in rural areas where there are no doctors. I am confident, in times to come, nursing profession will attain greater recognition and they will be empowered with more responsibilities, competencies and better facilities for improving the health services. I am sure, this noble profession will continue to attract competent and dedicated young men and women who will serve their communities with love and compassion. While congratulating recipients of these awards today, I wish to thank the entire nursing fraternity in our country for their dedication and service to the nation.